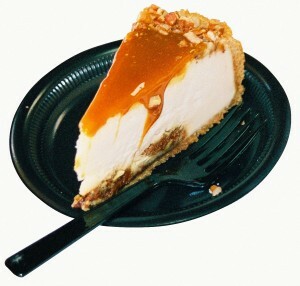 I went to a restau­rant recent­ly, one that could be placed com­fort­ably in the same genre as Cheese­cake Fac­to­ry. Nice atmos­phere, food’s great. But what stood out most to me was the way they mar­ket­ed desserts. What would you think the top rea­son is that peo­ple don’t order dessert? I’d guess that the first or sec­ond (the oth­er being health/weight con­cerns) is that their entrée leaves them too full to eat more. How do you sell a dessert to some­one who’s too stuffed to eat one? Get them to order it before they’re stuffed. Our serv­er ini­tial­ly men­tioned, then remind­ed us on almost every appear­ance she made at our table, that all of their desserts are deli­cious, made‐to‐order and take up to 30 min­utes to pre­pare, so my din­ing com­pan­ion and I should get our dessert order in ear­ly if we don’t want to wait. This might not give a non‐critical thinker pause, but — you know — I tend to notice when someone’s reach­ing for my wal­let. I also under­stand that restau­rants tend to run at pret­ty slim prof­it mar­gins, and how impor­tant attach rates of desserts, drinks and appe­tiz­ers are to their busi­ness. They real­ly want you to have that slice of cheese­cake, even if they’re prob­a­bly going to be box­ing it up to‐go. Clever, huh? Previous Previous post: Art imitating writegeek?